Cleavage fracture which occurs without any major deformations is defined as the separation at defined crystallographic levels in metals which only allow for very low or no transverse sliding. Therefore, the cleavage fracture mechanism is restricted to cubic body-centered metals or metals which are hexagonally packed with utmost density. It only very rarely occurs in cubic face-centered materials, mainly in corrosion effects. Cleavage fracture seems to occur at spots with restricted crystallographic sliding such as grain boundaries, sub-grain boundaries, twin boundaries, foreign particles, intersecting sliding bands, etc. The cleavage fracture expands at a high speed. This process only consumes little energy which might allow for the fracture of short cracks or shallow notches. 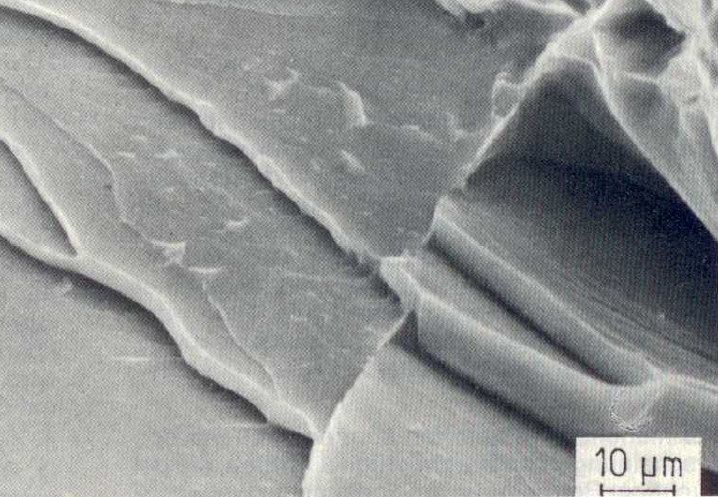 The gap surfaces of fractures without deformation are not ideally smooth but have linear structures which are generally referred to as river steps or river patterns and tongue steps.